”Round and around we go”…..
”Same procedure as last year? Can’t helping remembering those two quotes in relation to those so called scholars now saved using more CO2 themselves than normally occurs during any summer in the Antarctic…. but still less open ice than 100 years ago when the exploring of the Antarctic were the new science. Those were the days. They shouldn’t have tried the last part in the quote. The line regarding cloudes. Professor Steven Sherwood at least received his Bachelor degree in Physics from the Massachusetts Institute of Technology in 1987…. he seems to have forgotten all he once must have learnt…. 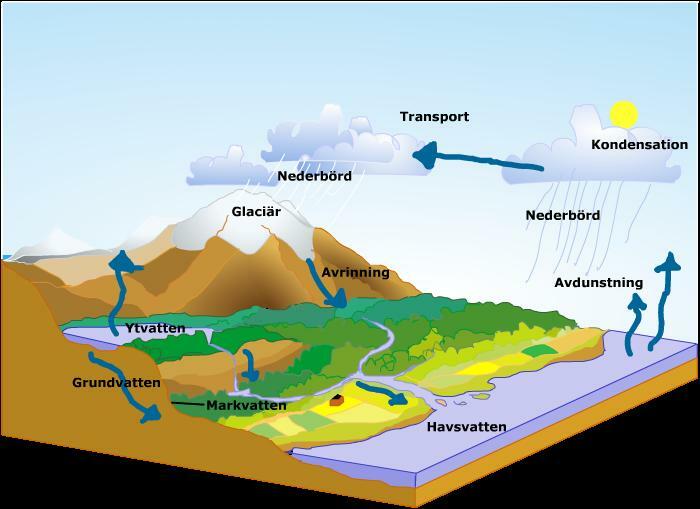 What the so called scientist showed was lacking knowledge of the Watercycle…. Here in Sweden that one used to be taught in 3th grade and then again i 7th-9th grade…..
c) Hur bildas det moln? (What form the cloud? What is meant by the water evaporates? Why is the sun so important to the water cycle? Professor: Stuck ship doesn’t mean much, cnn.com/video 2014/01/02 SO the ship doesn’t mean much. In other words risking several ships’s crew in attempt to save the so called scholars doesn’t ….. Not even in my dreams I would have thought it possible for any scholar to be so egocentric. Btw WHO is Professor Stuck? Which Subject? His credentials with or without a CV doesn’t seem to show up on Google search…. The team was attempting to retrace the steps of geologist Douglas Mawson, who led the Australasian Antarctic expedition between 1911 and 1913, and also to examine how the pristine environment had fared after 100 years of climate changes. Strong winds sweeping sea ice against one side of the ship pinned it in place at Commonwealth Bay on Christmas Eve. An attempt on New Year’s Day to evacuate the passengers by helicopter was also abandoned because of heavy rain, strong winds and cloud. I take it that most persons reading this are unaware of the fact that those clowns used readings re. CO2 from a vulcano, most of them choosed one in Hawaii….. Please get your ”facts” streight! Source volcanoes: McClelland et al. Note! Values above are all estimates with one significant difference: those for the volcanoes are based on real measurements. The one of man is a pure computer product and therefore a very rough guess. (It isn’t difficult to realize why …) Also, skepticalscience.com is a pro AGW site, so twisted ”facts” are presented there. Something important: Only a handful of total ~150 active volcanoes around the world are mentioned above, all above sea level. Dormant and ”dead” volcanoes also emit carbon dioxide! Furthermore, there are a large number of ”white” and ”black smokers” below sea level, all emitting carbon dioxide. A count is in progress and today no one know exactly how many that exist. (Real) Scientists are aware that there are a large number of them. Adding natural decomposing processes we get aprox. 700 Gton/year representing 95-98% of the total annual carbon dioxide cycle. This is something you should have learned in mandatory school …! Special thanks to Sasja. round and around….. twist again, like we did last year… one of my own favorite tunes back in 60’s…..